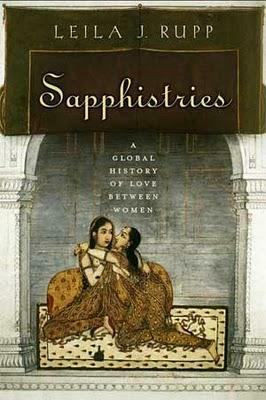 Sapphistries is an epic journey through real and fictional love between women. It is so epic that the author, Leila J. Rupp, had to coin a new term to describe this type of book. It is not just a history; it is an interweaving of prehistoric musings, fictional accounts that draw on suppositions of what it must have been like in times when no evidence was left of when and where these kinds of love was forbidden, right up to the modern day. I say these kinds of love because Rupp has effortfully but effectively convinced me that I need to know about the whole she-bang. It’s not easy to keep track of lesbians throughout history when people didn’t self-identify as such. This book takes in the whole gamut of potential interpretations of women-loving-women: social males, women who live as men but retained their female identity, third and fourth gender identities, women passing as men, two spirits, secret weddings, school girls having accepted but secret relationships as a cultural yet unofficial rite of passage in various modern cultures... as a run-of-the-mill modern lesbian, I was a little overwhelmed. This varied interpretation of ‘Sapphistries’ is extremely broad, and definitely widened my perspective on what I think the author would like me to consider a part of my culture. Primary and secondary source material across the span of human history is combined with fictional accounts throughout the book. I personally found the interweaving of fictional accounts and historical details a little too seamless at first. I had to flip back and forth a few times mid-tale to remind myself which was which, but I eventually got the hang of it and had a much better contextualized grasp of what I was reading. I thoroughly enjoyed the re-tellings and re-imaginings of ancient women-loving-women. With Rupp's first-person interjections and a storytelling tone, the book reads like a long and enjoyable university lecture delivered by a witty, warm, and knowledgeable teacher. I would recommend this book for women’s studies, literature, queer theory, or history syllabuses. I even suspect it would make for an excellent module on its own, with some supplementary reading thrown in. It’s no coffee table book—this is some serious reading and I personally would want a sherpa to guide me through it the next time I read it. Sapphistries is particularly invaluable for queer theory because of the vastly broad picture it presents of the grand scope of women who love women—regardless of whether they identify as queer or not. This book opened my eyes to the many positive and negative perceptions and lifestyle choices of those who were a part of ‘Sapphistry’ in the past, and I look forward to seeing how it informs future study and thought.